New Page in the You Tube characters tab with video blogs of my tales as an Uber Driver. Some funny stories and more to come. Updates on the progress of Volume 3 in the 'Angel in a Demon's Cloak' series. Also my insights into Life, Love, Politics and Spirituality. 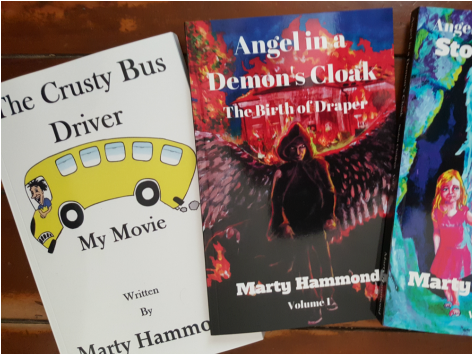 Marty Hammond has been using his creative and artistic skills for many years in various genres. He has spread his wings in performance art, such as Stand up comedy and other theatrical ventures. He then discovered YouTube and wrote, performed, edited and did post production, creating a menage of characters. In the latter years he has become an accomplished poet and author, while also sculpting some amazing pinata portraits using paper mache' and his unique painting skills. Also an investor in Bitcoin and can help you to make money while you sleep. This is so Awesome. Please take your time exploring the Website, as not everything may interest you, but I am certain that there is something that will. available on Amazon in either paperback or on eBook. be offering signed copies of all three of my books for a special launch price during the month of May 2016. This book has already had some amazing reviews, but you must realise you have to read the first volume to get the whole picture of the story. The links to the books are available on the book shop page. I have republished the book with this new cover on the book. The way he can take the thoughts from my head and produce it perfectly in the picture is awesome. The second book has also been published and Navid has done a fantastic job illustrating the cover for that book as well. The New book which will be Volume 3 in the series is titled 'Secret Societies'. It has a few new characters both on the team and against the team, still with the creation and discovery of Draper's supernatural talents. For the many that have read the first two books, you will really enjoy this extension of the story as the continues to grow in stature. The Crusty Bus Driver is still selling well and the public has been very gracious with their reviews on the book. This is purely real life comedy with a touch of creative license involved. If you have ever driven a bus or ridden one to go to work or school, you will be able to relate to many of the scenario's in this book. Go to the books page to get all the details about getting your copy. The cover for the first Angel in a Demon's Cloak book, "The Birth of Draper" has currently been redesigned and is now available on Amazon.com in Kindle and paperback. The same artist Navid Bulbulija has also designed the cover for the second book in the series "Stolen Children" which is now available, and I will be asking him again to design the cover for Volume 3 in the series. Keep in touch with these posts or my Facebook page for the launch.